Just three years after the second generation NSX was released, Acura has introduced some revisions for 2019. Stiffer sway bars and hubs, improved chassis design, and stickier tires have taken an already remarkable supercar and fine-tuned it for even better performance on the track, as well as on the street. The enhancements don’t end there. Aesthetic changes, like a facelift, new interior, and exterior options, and the addition of the stunning Thermal Orange Pearl color option make this piece of mechanical artwork even more brilliant. Features that were once only options, now come standard. This example of engineering perfection couldn’t be a better continuation of the legacy that follows the Acura NSX nameplate. Acura has always been at the forefront of innovation and efficiency, so it only makes sense that the car meant to illustrate the full extent of the brand’s capabilities features an engine and drivetrain that reflects its innovative trendsetting. The mid-mounted 3.5-liter DOHC twin-turbo V6 in the Acura NSX produces a combined 500 horsepower and 406 pound-feet of torque, enabling it to go 0-60 mph in just 2.7 seconds with a top speed of 191 mph. This mighty engine is paired with a 9-speed dual-clutch transmission, offering gear ratios engineered to ensure optimal power utilization in every gear. 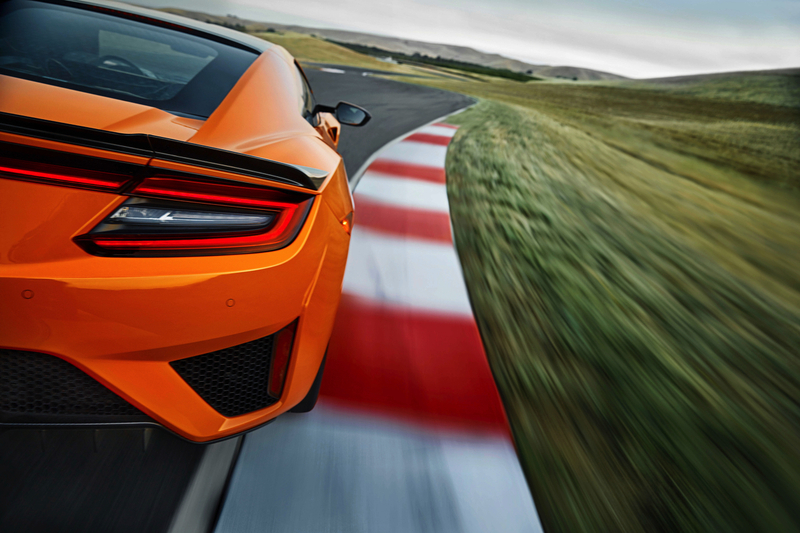 First gear is short and optimal for launching the NSX, which results in electrifying acceleration. The next seven gears have close ratios for a precise driving experience. In order to maintain comfort on the street befitting of a luxury brand, the NSX's 9th gear is long, which helps make the NSX a car that’s not just a monster on the track, but also practical on the street. 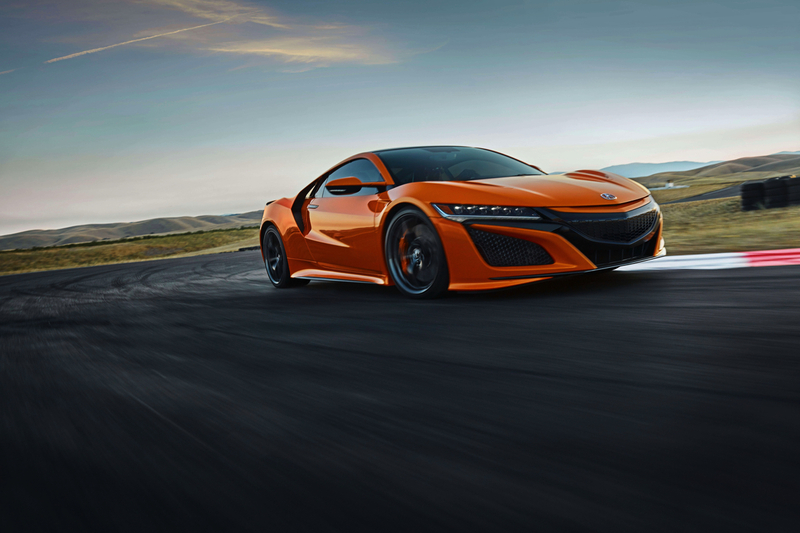 Since the NSX sends power to all four wheels using the Sport Hybrid Super Handling All-Wheel Drive® system, this supercar is planted to the pavement. Thanks to both torque and brake vectoring, power is sent to the wheels that need it most, and acceleration out of corners can happen early, shaving seconds off of lap times. In addition, solid mounts throughout the chassis and suspension and the updated sway bars all work together to mitigate body roll, so the NSX feels like it glides on rails. Whether you opt for the standard iron rotors or the optional carbon-ceramic rotors, the NSX is endowed with high-performance Brembo® hydraulic brakes, which translate to accuracy before entering corners. Hybrid regenerative braking transfers stopping power into battery power, further enhancing the car’s efficiency. 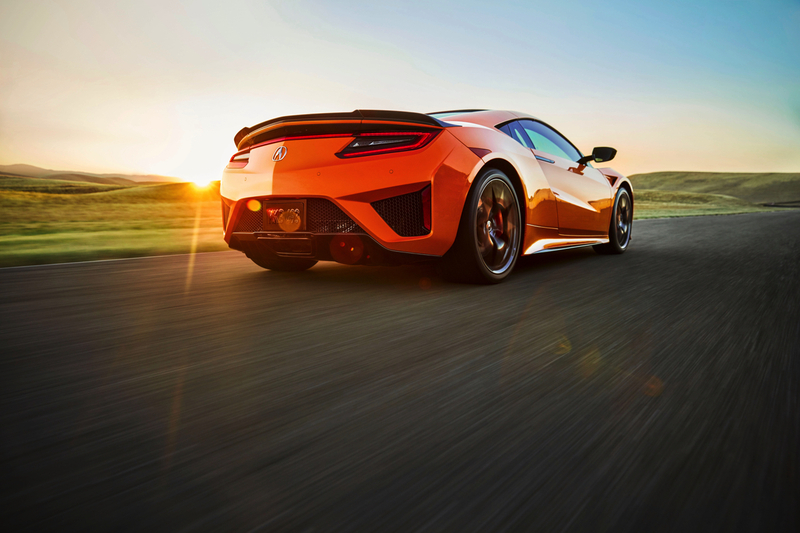 Outfitted with 3rd generation magnetorheological (MR) dampers, the NSX can adapt to road conditions seamlessly, giving it an unmatched connection to the road. The NSX is built on a foundation of research, born from the latest automotive technology and interwoven with Acura motorsports in its DNA. This car isn’t just fast and balanced, it's intelligent too. The Integrated Dynamics System allows the driver to choose between four driving modes: Quiet, Sport, Sport+, and Track. Each mode gets more aggressive, allowing the NSX to transform from a well-mannered luxury performance vehicle into a raw, limitless track car. To achieve this transformation, the Acura Integrated Dynamics System adjusts 11 components to reflect each mode: Electronic Human-Machine Interface, Electric Steering Assist, Electric Brake Assist, Active Suspension Damper, Electric Torque Vectoring, Electric Vehicle Operation, Accelerator Mapping, Shift Mapping, Vehicle Stability Assist, Engine Sound, Battery Management. Together, these components can unleash the full extent of the NSX’s power. Every line, air vent, angle, and curve of the NSX was carefully sculpted. Aerodynamics and wind tunnel testing shaped this supercar into a wind-bending machine. Functional air vents around the car help aid in cooling the motors as well as the batteries, engine, and brakes. Air moves through the front of the car, out of the hood vents, to air vents behind the doors, and into the intercoolers before exiting the back of the car. Air is also directed over the roof and down the rear glass, cooling the engine and transmission. The aerodynamic design of the NSX results in three times more downforce on the rear of the car than the front, which creates the ultimate balance at high speed. Acura has perfected airflow management with the NSX, and the result is a car that looks as good as it feels. Inside the NSX, the machine and the driver converge. Peaked fenders help the driver place the car on the road with precision, and thin A-pillars give the driver the best possible view. The interior is designed under the direction of functional minimalism, resulting in a sleek, driver-oriented cockpit. 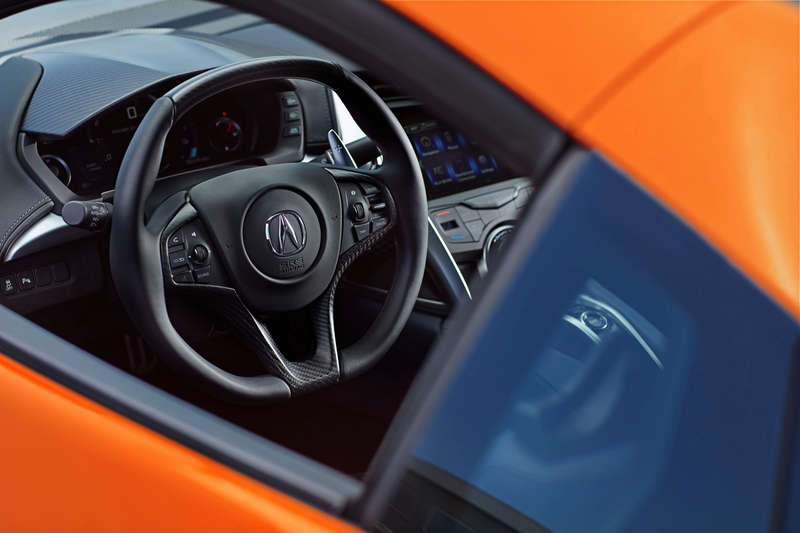 Materials like leather, carbon fiber, and Alcantara® maintain the lavish appeal of Acura. ELS Studio® Premium Audio provides a 9-speaker audio experience that creates a musical experience fit for the NSX’s design, technology, and emotion. Everything about the 2019 Acura NSX is balanced. From the rigid, yet willing handling to the powerfully efficient engine. The delicate balance of design, technology, and raw emotion makes the NSX a driving experience that cannot be replicated. To experience this supercar for yourself, contact 3 Birds Linking today for more information. *2019 EPA MILEAGE Based on 2019 EPA mileage ratings. Use for comparison purposes only. Your actual mileage will vary, depending on how you drive and maintain your vehicle, driving conditions, battery pack age/condition (hybrid only) and other factors.